The next intention, focus and frequency on our TA-DA! 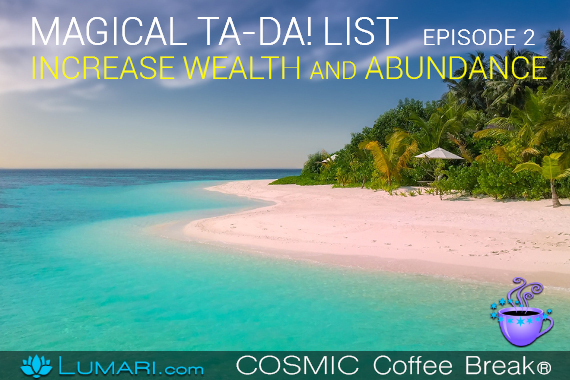 List is Increase Wealth and Abundance.Wealth and Abundance bring in flows of energy, capacity, opportunity and freedom. That wealth and abundance can help the pathway of fulfilling your soul, your destiny and your joy. Tune in, energize, align with and synchronize with those energies next on our TA-DA! List. As you listen to my voice, you can feel positive energies shift and change in your life. It happens in every coaching session, every workshop and every Cosmic Coffee Break podcast. It’s in the vibrations of my voice.